Donna my sweetheart and headcook of Butchers Daughter BBQ has always wanted to complete her bucket list to cook a sanctioned contest in Texas. 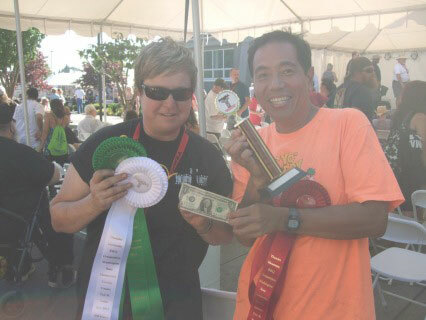 That opportunity came in February 2015 when her homie Cindy of Da Fraulein Swine BBQ who was a Pacific Northwest transplant to Austin invited her to cook an IBCA-sanctioned contest. Cindy and I were cooking on separate teams in August 2011 in Washington state. I got DQed for a tiny sliver of foil and Cindy was also DQ-ed for raw chicken. So to console the both of us, she did a little pole dance for everyone with a thong made of aluminum foil! We laughed at ourselves for our silly mistakes. I wish I could have joined them but had a full class to teach that weekend. Here’s the first part of Donna’s story. With the first day of spring drawing near, us BBQ folks are starting to get a little antsy. If you live in California, the grilling season only slows; it doesn’t ever really come to a full stop. For the rest of the country, save the South, we suffer from spring fever. Neither Harry nor I have cooked a contest since Lancaster and Laughlin last fall. However, that doesn’t mean we haven’t been busy. 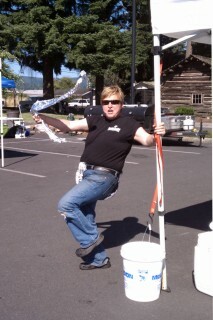 We’ve taught eight Slap Yo’ Daddy cooking classes and two CBBQA BBQ judging classes in four short months. Compress that schedule with Thanksgiving, Christmas, New Year’s and the Super bowl, and you have what is a typical Slap Yo’ Daddy schedule; busy. Now is a great time to check your grills, smokers and rigs and think about what kind of entertaining you’d like to do this year. Maybe you’ll get a tax refund in April and buy that piece of equipment you’ve always wanted. 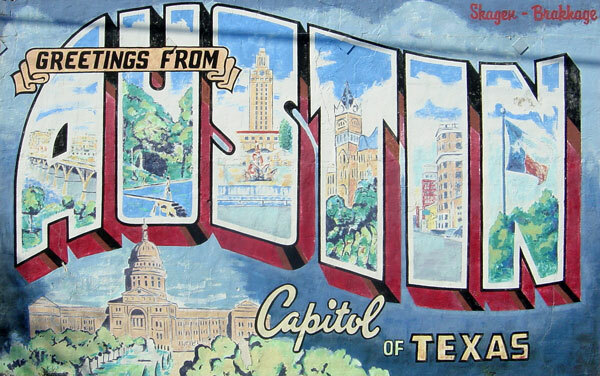 Or you can plan a trip to a place like Austin, Memphis or Kansas City and experience ground zero BBQ. There are contests and festivals (BBQ, chili, tacos, pierogies, you name it) all over the country that will give you an excuse to discover what our great nation has to offer. If your wallet will allow, take advantage of it. Life is short so live it now. This weekend, I’ll be traveling to Austin to cook with a friend I first met back in 2012 at a PNWBA BBQ contest in Longview, WA. As solo woman cooks, we became fast friends. 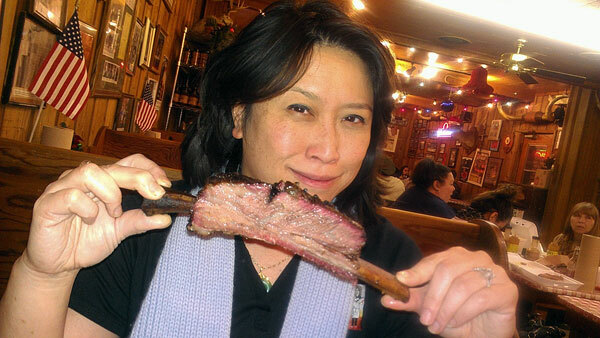 My buddy, Cindy Hayter, is a long time PNWBA cook and she returned to her roots in San Antonio a little while back. After some flavor adjustments, she’s been bringing home plenty of trophies. Last weekend, she won yet another Grand Championship in Texas. It only goes to prove that you can’t become a big time cook until you can cook somewhere other than your home state. Win on WSMs in big Texas and you’ll get the guys’ heads turning. And Cindy has certainly done that and more. Mind you, the density of BBQ contests in Texas is second to none. There are several contests if not dozens to choose from every weekend, unlike here in California. So most Texas cooks have more contest experience than at home. I’ve been warned that 80% of this weekend’s field has won a contest at some point. I’m fairly certain we will look like a strange site, two crazy gals cooking BBQ in the middle of Texas. But I’m also certain that we will have lots of fun no matter what happens. You need a cowgirl hat. Good luck! See you in Havasu. 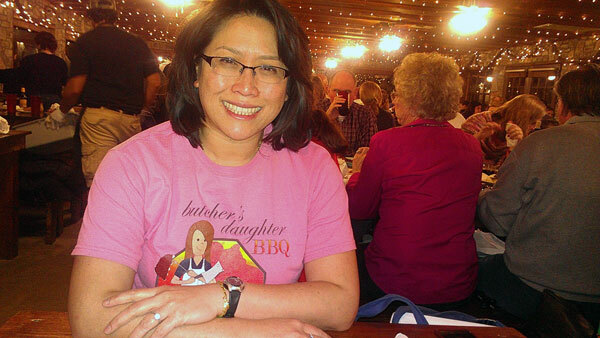 Good Luck Donna, Show those Texas Boys a couple West Coast Girls can BBQ!